Keep student loan debt from dragging you down. The situation: You have student loans and you will graduate in two to four months; or you have just graduated and are about to start repaying your student loan debt (you are still in the grace period). What this page offers: An outline of the steps and resources you need to take in order to create a repayment plan that is right for you. Graduating with your degree is exhilarating. Before you start your new career or head to graduate or professional school, you want a little break, right? The last thing you want to think about is your student loans. But taking time now to make the best plan for repayment can save you a lot of grief and money later. Before you start planning, check out these two brief overview videos. StudentAid.gov video overview about repaying federal student loans. This step is required for anyone who has received a direct federal loan of any type. The online session provides complete information on repayment requirements and options, but it must be completed in one session. So, later remembering the details covered can be tough. Preview the session or have a print backup. View the PDF of the 2016 Exit Counseling Guide. To best manage your student loan repayment, you must first get a handle on your total student loan debt. Do you have only federal loans, private loans, or a combination of both? Most borrowers have multiple loans. Each loan may have a different principal (amount borrowed), interest rate, monthly payment, and loan servicer. Use our interactive My Student Loans Factsheet to record important information about each loan. You can fill in your information on the PDF and print it or save it on your computer. The information to be recorded includes the date you took out the loan, the amount you borrowed, the interest rate, the amount of monthly payment and due date, the loan's servicer, and other details. Locate all your federal loans and info about them using the National Student Loan Data System. You will use your FSA ID (Federal Student Aid ID) to create an account or log in to your existing account. If you do not have a FSA ID, create one on the federal loan site. For answers to questions about a FSA ID, click here. Create and maintain a back-up file with the paperwork for all your loans. List information about each private loan. Locate your original loan documents to identify the information needed. Your loan servicer or lender should also have sent you a schedule of payments that indicates the amount of the monthly payment and the number of payments. 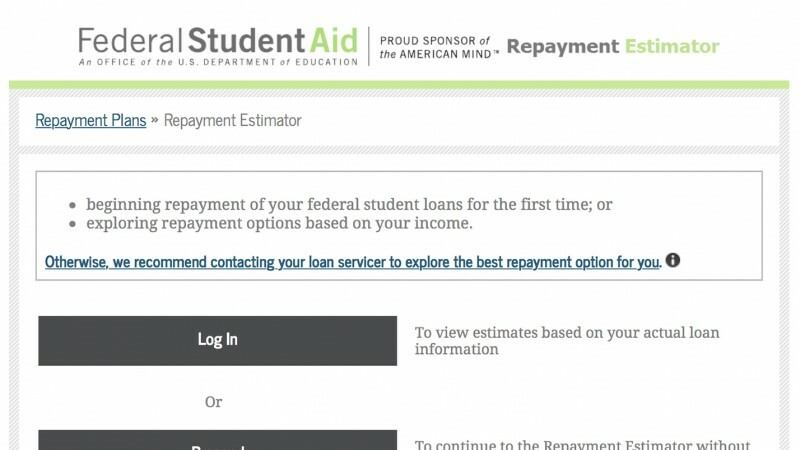 If you don't have such a schedule but have the original loan papers, you can estimate a monthly payment for each loan by using this repayment calculatorprovided by FinAid.org. For up-to-date information, you may need to contact the loan's servicer; contact information should be provided in the original paperwork. Create an account with each loan servicer if you have not already done so. It's your responsibility to keep all your contact information up to date with all your loan servicers—for both federal and private loans. If you move to a new residence or change your phone or email address, for instance, it's not the lender's or servicer's job to find you. So stay current with your info, open all communications from servicers or lenders (digital or paper), and keep a paper trail or secure digital back up of any records and all communications you may receive. Tip: Create and maintain a back-up file with the paperwork for all your loans. Remember to add the paperwork for each new loan. Note when each first payment is due and its amount. The servicer for each loan should send you the details of when repayment starts, the amount of each monthly payment, and its due date. Base these monthly payments on the standard repayment term for federal student loans—10 years. If your private loans have a shorter or longer term, use the monthly payment provided by your lender or servicer or use the calculator indicated below. For your private loans, manually total the monthly payments on all private loans as entered on your factsheet. For the total estimated payments you will owe each month, add together the monthly totals for your federal and private loans. Tip: In reality most borrowers have several different loans with different monthly payments and loan servicers, but this overall total will allow you to estimate "affordability" and your best repayment options. Can You Afford to Pay the Total of Your Monthly Loan Payments? Or is this amount too big for your income? Nerd Stuff: Want a more in-depth analysis of what constitutes affordable and excessive debt? Check out Who Graduates with Excessive Student Loan Debt?, a policy analysis by Mark Kantrowitz, former CEO of FinAid.org. The answer to this question depends on your income and living expenses. In general, a "debt service-to-income ratio" of 10% or less is considered affordable. That means that total monthly loan payments equal to 10% or less of a borrower's monthly income (adjusted gross income) are considered affordable. Some borrowers may be able to afford, as a "stretch," total monthly payments equal to 15% of monthly income. Use our calculator to determine the dollar amount equal to 10% (up to 15%) of your salary or projected salary. ___________Total monthly loan payments _______Projected payment (or payment range) you can afford. If your loan payments are less than your affordable figure, you are in good shape for paying off your loans as quickly and for as little money as possible. If your loan payments are more than your affordable figure, be sure to consider all the flexible repayment options for federal loans and strategies for private loans in the following sections. Your projected income for a beginning career in the occupation(s) in which you are seeking employment. If you have been job seeking, you may know entry salary ranges in your field. Many college Career Centers offer resources to help you in this task. You can also find estimated entry level salaries by using these online sources. The Salary Finder at CareerOneStop.org, sponsored by the U.S. Department Of Labor. You can look at salary ranges for 900 specific occupations and by city or state location. This tool reports low, median, and high salary ranges. Entry level jobs will most likely be in the "low" range; so use that figure for your estimate. Also check the entry level salaries for your field on Salary.com. Many college Career Centers use this site, although it is a commercial site. Warning: The site will be happy to sell you various customized reports, but just use their handy free entry level salary tool. Pay down debt as quickly as possible to lower interest costs. Select a plan that enables you manage debt, not have debt drag you down. In this step, you will first look separately at repayment strategies for your federal loans and private loans (if any). Federal loan repayment plans offer many more options than private loans. Plus, most borrowers have more federal loans than private loans. After these separate steps, you'll look at how to fit everything together for the best approach for you. Tips to keep in mind as you consider your repayment options. The repayment options in the chart below apply to Direct Loans (subsidized and unsubsidized), Stafford Loans (subsidized and unsubsidized), and Direct PLUS loans made to students. If you have federal Perkins Loans, contact the school that made the loan for repayment options. If you have a Plus loan for Parents, see our page for Parents: Managing Loans as Part of Financing Your Child's College Education. The federal student loan program offers both traditional and flexible repayment plans. You may compare monthly payments under any of these repayment plans using the Repayment Estimator. To automatically use figures from your loans from the National Student Loan Data Center in the calculator, log on to your account using your FSA ID. The Repay Student Debt tool from the Consumer Financial Protection Bureau may also help you compare options to determine which are better for you. Standard Repayment Plan — Fixed payments over 10 year term. You get this plan if you don't pick another option. Graduated Repayment Plan — Payments start low and increase every two years over a 10-year term. Extended Repayment Plan — For Direct Loan borrowers who have more than $30,000 to repay. Payments may be fixed or graduated (start low and increase) over a term up to 25 years. This chart from StudentAid.gov compares the terms of traditional plans. Would a Federal Consolidation Loan Be a Smart Choice? If you have more than one federal student loan, combining them into a single federal Direct Consolidation Loan may simplify repayment. If you need to lower your monthly payment, you may also be able to extend the repayment term on a consolidated loan using an Income-Contingent Repayment Plan. However, you will pay more interest overall with an extended plan. Use this Q&A from StudentAid.gov to consider the potential advantages and disadvantages of a Direct Consolidation Loan. If you have more than one federal student loan, combining them into a single federal Direct Consolidation Loan may simplify repayment. Warning: In most cases, don't even think about consolidating your federal loans with private loans. Because private loans cannot be included in a federal Direct Consolidation Loan, consolidating federal loans with private loans requires a private loan. As a result, you would lose the protections and many flexible repayment options that your federal loans have. Click here for a brief review of the issues from the Consumer Financial Protection Bureau. Flexible Income-Driven Plans enable you to select a plan that fits your monthly payment amount to your income and ability to pay. These plans also feature terms that extend beyond the standard 10-year term. If you have not repaid your loan in full at the end of the extended term, the outstanding balance will be forgiven; however, this forgiven balance is usually taxable as income. In addition, you will pay more overall interest on these extended terms. Pay as You Earn Repayment Plans, PAYE (since 2012) & REPAYE (since 12/17/2015) — Payments based on 10% of your discretionary income but never more than the Standard Payment. Up to 20 years to pay. Income-Based Repayment Plans, IBR — Payments based on 10% of your discretionary income (new loans since 7/1/2014) or 15% of your discretionary income (loans before 7/1/2014) but never more than the Standard Payment. Up to 20 years (post 7/1/14 loans) or 25 years (pre 7/1/14 loans) to pay. Income-Contingent Repayment Plans, ICR — payments based on a percentage of your discretionary income. Up to 25 years to pay. Debt relief scams directed at students. Unscrupulous private lenders advertise that they can get student loan debt discharged or forgiven. All they are doing is charging big bucks to file a Direct Federal Consolidation loan—something any borrower can do for free. Plus their "services" CAN NOT get student loan debt discharged or forgiven. Secretary of Education Arne Duncan's highlights these debt relief scams directed at students in the video on the left. A consumer advisory from the Consumer Financial Protection Bureau details the problem. Nerdwallet tells you how to recognize these scams. Are Loans Deferred if You Go to Graduate or Professional School? What About Other Situations that May Qualify for Deferment or Forbearance? Yes, if you enroll in graduate or professional school (and are at least a half-time student) then payment on your direct federal student loans and Perkins loans may be deferred. If you have subsidized loans, the government pays the interest during deferment. If you have unsubsidized loans, the interest continues to accrue during deferment and may be capitalized into the loan principal when deferment ends and repayment begins. You may also qualify for a period of deferment of payments of federal student loans if you are serving on active duty in the military, are experiencing a period of unemployment, or are working in certain occupations (see the next section). Read this Q&A from StudentAid.gov for a more complete explanation of deferment and forbearance. What About Programs that May Qualify for Student Loan Forgiveness? After you have been a full-time teacher for at least five years in qualifying fields and in qualifying low-income schools, you may apply to have a certain amount of some federal student loans forgiven or cancelled. The same is true if you serve in certain public service jobs. You must apply for these programs. This Q&A from StudentAid.gov provides additional detail and resources for these programs. The Q&A also covers other circumstances which may qualify for loan cancelation or forgiveness; these include full and permanent disability, death, certain school closures and other situations. Tip: Signing up for direct loan payments can reduce your interest rate by about 0.25%. Some lenders may also offer a discount for paying on time for the first twelve months or more. Check with your loan servicers for details of discounts they may offer. If you were enrolled in a campus that was closed by one of these or similar institutions, you may be to get loan cancelation (forgiveness) for federal loans. Did You Attend a For-Profit School That Has Closed? In recent years, a number of for-profit colleges have closed their doors, often as a result of investigations and sanctions by the federal government. These schools include many locations operated by ITT Education Services (ITT Technical Institution), Education Management Corporation (Brown Mackie College), Sanford-Brown, The Art Institutes, Le Cordon Blue, Westwood College, and Corinthian Colleges (Everest, Heald, WyoTech). If you were enrolled in a campus that was closed by one of these or similar institutions, you may be to get loan cancelation (forgiveness) for federal loans. If you were former student, in some cases, you may also qualify for federal loan cancelation (forgiveness). For more information about this process, see this Q&A from StudentAid.gov. Note that typically, even if you qualify, you must apply for loan cancelation; it is not automatic. You may also call 1-800-4FEDAID for information about your particular situation. You have already compiled facts about your private student loans on your factsheet. So you can see if, like most private loans, your private loans have higher interest rates than your federal loans. Do they have variable or fixed interest rates? Many private loans have variable rates. Depending on the terms of your private student loans, you may wish to consider some of the following options. Consolidating your private loans into one loan. If you have a good income and a high credit score, you may be able to refinance your private student loans into one loan at a lower interest rate. Because interest rates are currently at an all-time low, they are likely to rise in the future. If you can obtain a fixed lower interest rate, that might be a good option. Make sure any consolidation loan does not have a prepayment penalty. This short article from the Consumer Financial Protection Bureau offers additional pointers on consolidating private student loans. Determine what options, if any, your private lenders may offer for deferment or forbearance. Consider paying off high interest private loans first. If you have extra money or make an effort to free up extra money in your budget, making regular payments toward the principal of a high rate loan can reduce its cost and shorten the time to pay off. Before you attempt this, be sure the loan does not have prepayment penalties. Signing up for automatic payments may provide a small discount. Check with your loan servicer. An annual review of your student loan repayment plan will help you adapt your plan to your current life and work circumstances. For instance, a work promotion with an increased salary may enable you to make extra payments toward the principal of your most expensive loan. Such extra principal payments can shorten both the amount you pay in interest and the time to total repayment. On the other hand, if your employment has changed with the result you are making less money, you may choose to switch to one of the income-based federal repayment plans to help relieve stress on your budget until you recover financially. One of the benefits of federal loans is that you can switch repayment plans as needed; the same is not usually true of private loans. As these examples illustrate, making an annual review of how your loan repayment is going can help you continue to meet your goal of paying off student loans as quickly as possible without causing financial hardship. Can You Get Out of Debt Faster? It's Possible! Make extra payments every month toward paying down debt. Include this extra money in your budget. To free up extra money, spend less on living expenses, including housing, transportation, clothing, dining out and entertainment. For example, most people working first on repayment continued to share a modestly priced apartment and drive their old cars. They ate out about once a week or less, spent little on cable/internet entertainment, and sought out free events. They gave up shopping as a recreational activity. Work an extra job and put all that income toward debt repayment. We read of a recent grad who had a good job as an engineer. He also waited tables every weekend and used that extra income along with a percentage of his good salary to pay down significant amounts of his debt. Put freed up or extra income toward paying off your most expensive loan first. This is often a private loan. Alternatively, pay off your smallest loan first. Chose the strategy that gives you the greatest incentive. If you go on to graduate or professional school, arrange to continue to pay off the interest on any loans where, though repayment is deferred, interest is accruing and will be added to the principal of the loan. Many servicers offer such payment options, so check for details. Repaying Your Loans, a downloadable overview from StudentAid.gov in English or Spanish.